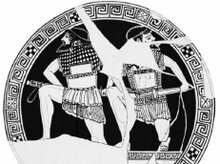 Myth 1: "The rim on the aspis evolved as the shield became heavier to allow the weight to be borne on the shoulder as well as the arm." If you look at the cross-section of an aspis, it is clear that the rim section is far thicker than the core of the face of the shield. Thus a substantial portion of the weight of the shield is in the very rim that they would hypothesize grew to ease the carrying of said weight! A rimless aspis is no heavier than many other single grip shields. Sure, there are images that show the hoplites hanging the shield of their shoulder by the rim, but there are far more showing hoplites with their Corinthian helms pushed back, and I doubt many would support fighting with them in this position. Hanging the aspis by its rim on the shoulder simply takes advantage of the profile, which evolved for a very different purpose. Myth 2: "Hoplites pushed en masse with their bodies side-on, their left shoulders in the bowl of the aspis, pressing into the back of the man in front." The illogic of this one becomes apparent if we try to envision a file doing so. Clearly this can only work for the second ranker pushing the first ranker. Beyond that the men's backs are perpendicular to the men behind them! The could push into the right shoulder of the men in front, but that renders weapons play impossible- something the side-on stance is supposed to allow. The other problem is that at anything approaching maximum pushing force for a file, the men would collapse into the bowl of their shields in any case and be square to the foes as they should be. Myth 3: "Hoplites charge rapidly to add momentum to othismos." This one is counterintuitive, so I don't blame them for not foreseeing it, but a slow packed advance generates more force, faster than a series of single men impacting like rams. With no need to move to othismos directly from the charge, an extended period can occur of spear fencing prior to a pushing occurring. This eliminates a major difference between the pro- and anti- push crowds.